Matt Flynt of Winston-Salem, NC thinks he may have snatched up a remnant of American Civil Rights history. Perusing Craig’s List, Matt saw an ad for two “F.W. 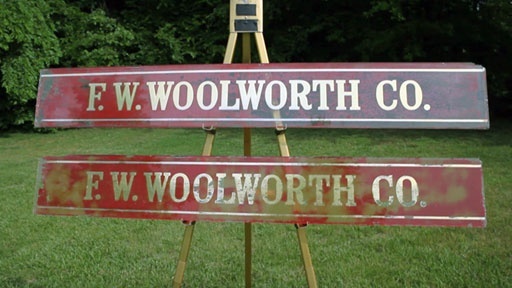 Woolworth Co.” signs. He’s a history buff and he knows desegregation sit-ins took place at a Winston-Salem Woolworth’s lunch counter in 1960. The seller claims he helped clean out a closed Winston-Salem store in the 1990s. He found these signs on the floor and they’ve been sitting in his basement ever since. Matt asks History Detectives host Tukufu Zuberi to find out whether these signs were part of the scene in an early victory for Civil Rights. Related Investigation Lee Family Doll Did this doll belong to a former slave of General Robert E. Lee? Also in Vietnam Era: 1960-1980 Frank Zappa Collage Is the artist who created this piece Frank Zappa? Also in Vietnam Era: 1960-1980 Beatles Autographs Are these genuine Beatles signatures? Also in Vietnam Era: 1960-1980 Ronald McDonald Costume Is this the costume that helped serve up a billion Happy Meals? Also with Tukufu Zuberi Birth Control Box Could this unusual wooden box be an early contraceptive device?